Integrity Welding & Fabrication, Inc. was founded on the skills, talent and work ethics of Bruce Ashley. Working at the mines in Leadville, Colorado in the late 70’s, Bruce learned the core elements of welding and fabrication. There he developed a deep knowledge about what is necessary for industrial and mining welding applications. After that time in Leadville, he relocated to Western Colorado and furthered his work in the burgeoning “oil shale boom”. He found himself working with even more specialized welding applications and he perfected his skills in Tig, Mig, and Stick welding on carbon, stainless, Chromoly pipe and all other metal fabrication necessary to the energy industry. Then in 1987, he relocated to Colorado Springs and continued welding and miscellaneous specialty fabrication work. When Colorado went through a recession, Bruce went into the insurance business for a while and learned how to manage a business and attend to good customer service. Even though he was now a well-rounded businessman, he still yearned for the satisfaction of building and fabricating things, hands-on. So he moved from behind the desk to getting hands-on once again by building things out of steel and welding them together. With himself now back in welding, he opened his shop in 2003 and has been doing just that ever since. Welding was always his passion and what he still loves. 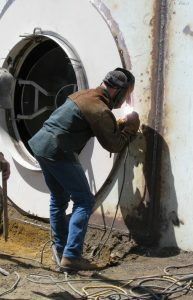 It shows in his work, and is reflected in every aspect of Integrity Welding. As Integrity Welding & Fabrication, Inc. continues to grow and add more staff, services and customers, we will always be passionate about high-quality service and satisfaction. We strive to keep that our goal every day. That is our promise. Bruce Ashley, President of Integrity Welding & Fabrication, Inc. Integrity Welding & Fabrication, Inc.